Refrigerator with or without water on the door? There are a couple things that aren't included with the build -- a water softener (which is a must in our area) and a refrigerator. The other appliances are included with the home price, but the fridge is one we need to get on soon. In our last house we had a couple different refrigerators. Neither I would highly recommend. The first pooped out on us and we ended up having to do an insurance claim because the ice melted and ruined our old floors. Fun times. And if I remember right Kenmore is actually LG, and our appliance guy didn't service that brand for some reason. So we always had to search for someone that would. By the way, go here to see how I kept that one so clean (easiest cleaning ever, I promise). Not only was it pretty, but it worked great and was SUPER easy to clean. I've never had all matching appliances in my life. A first at nearly 42 years old! So I'm kind of excited about that and we plan on purchasing a fridge in that same brand. Here's the thing -- normally our builder does a little build out behind the refrigerators in their homes so the buyer doesn't have to pay extra for counter depth. Love that -- but unfortunately our plan didn't allow for it. The counter depth design is a little more shallow so it doesn't stick way out into the area in front of it. They are awesome because they fit nicely into the spot, but are usually more expensive. See?? It even has soft close drawers. INSIDE the fridge. I mean, come on. There's a water dispenser inside and the ice comes out into a tray in the freezer. So here's my question for you all -- anyone have a fridge without the water and ice dispenser on the front? Do you love it or hate it? If you specifically have this design I'd love to hear your thoughts! I've read that it's kind of a pain to get water because you have to use two hands. I can see that being an annoyance. And we would miss crushed ice, not gonna lie. But this baby is nearly HALF the price of the other ones so I'm considering it. I would like not having to clean up after the water on the front all the time. And the ice on our old fridge would get iced together so we'd have to reach in there all the time to get it unstuck. This one would have a much bigger bin for ice as well, so we'd have much more on hand when we had people over. Let me know your thoughts! You guys always have good info to share. I'll be back with a house update later this week! No help here! Have never had fridge with water and/or ice maker. I dream of having one with an icemaker! 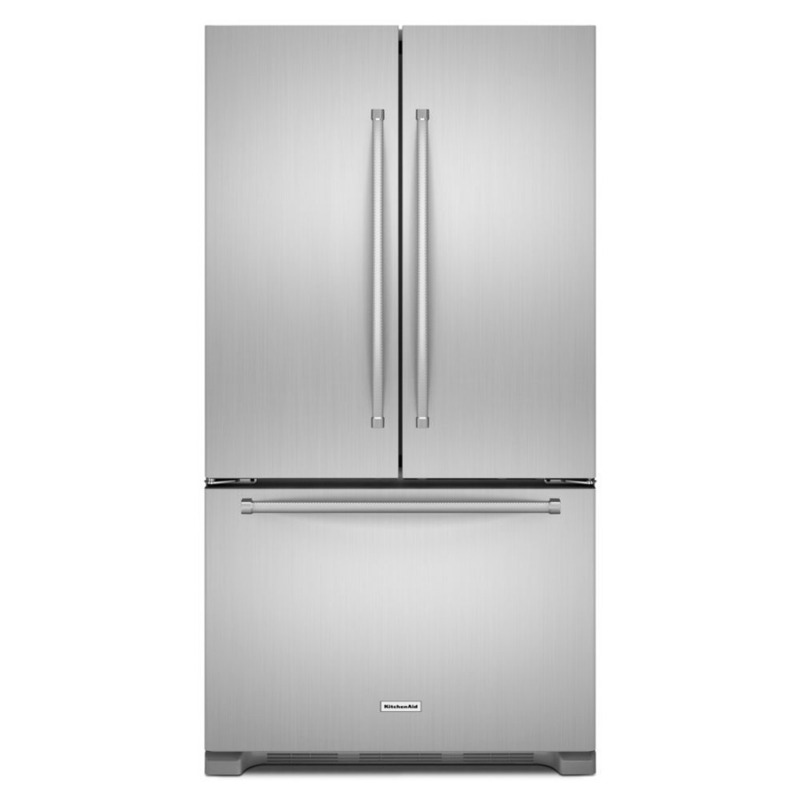 Our fridge is a GE Profile counter depth with French doors, similar to the second refrigerator you're considering. I actually LOVE that it doesn't have the water/ice in the door, mainly bc it gives me more storage inside of that door! Those dispensers take up the vast majority of the inside of the door they're in! It honestly doesn't feel like an inconvenience at all to have to open the door/drawer for water and ice. Ditto on the GE Profile - I love not having water marks on the outside of the fridge (and in my case, keeping my short people away from flooding the house). I don't think it's super inconvenient, but I also never had a fridge with the water/ice on the door, so I'm biased. Sorry to disagree about the GE Profile. We bought a French Door / bottom freezer that looks like the one in your picture in 2006 and it was a problem from the beginning. I.WILL.NEVER buy another GE PROFILE again! The motherboard failed - twice (cost to replace around $300 - don't remember exact figure); first time within the first year - still under warranty. The second time about 18 months later - we had to pay for it. Every single plastic part . . . drawer handle, frame around inside freezer drawer, latch to keep French doors closed, etc., on the inside broke. The top latches that broke on each door, could not be replace without replacing the entire inside panel of the door at about $250 EACH. The fridge and freezer temps were always higher than recommended. And, I hated the inside water dispenser. It was ackward to use. We finally replaced it last year with the Whirlpool WRX735SDBM, on sale at HOME DEPOT for $1,697.40; at that time it had almost 5 stars review from more than 2800 people. It has an outside water/ice dispenser that really does not take up too much space inside. The design makes good use of interior space. It has a center drawer below the main fridge, that we use for produce and kids snacks. Because of this set up the contents of your fridge very visible. Its been a year and we just loved this appliance! I have the whirlpool mentioned by MO's place above....I LOVE it! We put all the snack food and fruits and veggies in the drawer! I've never loved a fridge before, but this one...it's love! Ditto about the GE Profile - terrible. Do not buy!!! We've fixed ours every year we've had it for the same issue every time. We'r getting read to replace it so I'm anxious to see what you pick! I agree with the original commenter about loving the extra space and not having an issue with reaching inside for water or ice. I have a model similar to the second one you are looking at but it's LG. We've only had it about a year so far, but no complaints yet. I'm not recommending GE Profile, just that particular style (French doors without water/ice dispenser in door). The only reason we stuck with that brand is because that's what our other appliances are and I wanted everything to match without having to buy everything new. I love the sleek look BUT I use the door water over 20 times a day. Think of the extra energy used to cool your fridge every time you open the door to get water! Food spoils faster, costs go up, you have to use two hands! It's still tap water as it comes from the main water line, but going through the fridge it runs through the filter and it's already cold, so you don't need ice. 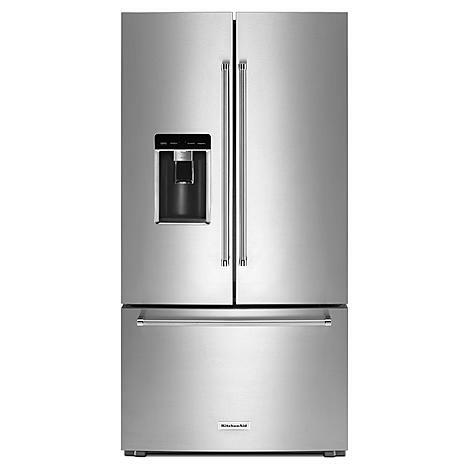 We just bought a french door Whirpool refrigerator without the ice maker and water dispenser on the front. We don't have a fancy one with the water dispenser on the inside (I wish I had known about that) but it has an ice maker on the inside of the freezer. We don't need ice much so I preferred one without and I like the sleeker minimalist look. I would totally go with the one that has it on the inside! I never comment but I had that exact fridge with the water on the inside. We had nothing but problems with it when we moved into our new build 5 years ago and fought with kitchenaid to have it replaced after it kept getting warm for no reason and ruining our food (it would get very warm and then next day be back to normal) We had countless repairmen in and kitchenaid themselves and no one could figure it out. All of our neighbors moved in same time as us (new construction builds) and in 5 years EVERY SINGLE ONE has had issues. They finally agreed to replace it for free after my husband called daily and complained and so far we have a newer model and no problems what so ever (fingers crossed!) so if this is a new model you may be ok. had to give my 2 cents. Our last fridge had the water on the inside and we didn't mind it. I'd say the only reason it could be a bit of a pain (we're truly talking first world problems here) is that it isn't as intuitive for your guests. Not a big deal in the long run though. Had a Samsung fridge with water and ice in the door that had problems from the very beginning. After working on it multiple times we finally got rid of it and replaced with a fridge without either on the front. We love it! We had the same set up in our last house but my husband convinced me to get the one on the front when we were building our house. So now we are happy again with our 'cheaper' fridge. We never really used crushed ice so that wasn't an issue for us. The ice bin does take up some freezer space but worth in imo. And we do have a water dispenser in the fridge. Never even thought about having to use two hands until you said that! Haha!! I just moved into my first house WITH an ice and water dispenser, and I totally love it. I use it all the time and I wouldn't ever buy a fridge without it now! I know it might seem crazy to spend the extra now, but refrigerators last a long time to. PS. I just love your style! We have a Samsung (water and ice in the door, as well as video screen) and love it. No problems. It is the french door side by side, and then has one "snack" drawer and the freezer drawer. I love the "snack" drawer, easy access and we aren't opening the larger portion of the frig all the time. Our other appliances are Kitchenaid (architect series with curved handles). However, I believe they are starting to go more toward the industrial look now. We have a counter depth Whirlpool side by side with the ice/water on the outside. You can even remove the ice bin, which is a plus! We had fridge that had water on the inside. We hated it. At first, we didn't even know it was there! It only put out water, so you still had to get ice from the bin, which was an inconvenience. You did have to use two hands. And I didn't like guests having to open the fridge to access the water. Not a fan of people being able to see inside my fridge, feels like an invasion of privacy for some odd reason. We also hated the slide out freezer because it always seemed to be a chaotic mess no matter how often we organized it. And the ice bin was not covered, so it would get dirty often. My fridge has the filtered water dispenser on the inside (not the same model as the one you're considering, but similar). We are all used to it and never actually had the kind with the dispenser on the outside, so I don't think about the inconvenience of having to open the fridge to get water. It does tend to collect a little pool of water at the bottom of the inside of the fridge when my kids drip a bit - and this little pool will turn into an ice cube that I then discard a couple times per week. Not a big deal. I like having the entire front of the fridge clear and smooth, although we do hang up photos and artwork. We have used the door water and ice at our parents' houses but when we bought our fridge we decided not to get one with it. We use an Brita water pitcher in our fridge and just fill it from the tap. Ours can make ice but we never bothered getting a line run to hook it up. I love the french door with freezer on the bottom. Our parents both have side by sides and a feel like you have so little room. We didn't go counter-depth because we felt like you lost a lot of space. I love the sleek design of a fridge without water/ice on the front. We have a fridge that has a water dispenser inside, and an ice maker in the freezer. But honestly we never use the eater from the fridge dispenser. We have an RO system and a faucet by the sink that the RO water comes out of to drink. So if you buy the second fridge, and save some money, get an RO system for drinking water!!! I agree. The water here by the Colorado River and in our CA home is SO hard. Would never drink the tap water. I have a Kitchen Aid with the water on the inside. I preferred the plain, uninterrupted look of the doors without the dispenser on the front. Like you, we only have 3 people who live in this house, so it's not a biggie to open the door and reach in for the water. To me it's no different than reaching in for any other drink, like juice or a pitcher of water. If I had lots of kids, I might feel differently. My chief complaint about my counter depth Kitchen Aid is that the produce drawers are not big enough for us. My favorite thing is the wide meat/cheese drawer. That thing holds a ton! The thing about the water dispenser on the inside is is you ever have people over and they are helping themselves to water they have to open the fridge to get some. I've only experienced this as a guest at someone else's house and for some reason it annoys me that I have to open their fridge. Other people's fridges are gross and I don't want to see or smell anything in there. That's my issue with the water on the inside! My brother has one with water in the door, and they don't love it. It means friends have to open your fridge every time they use the water, so it can be a bit annoying if it's not clean. Also, the water spills inside instead of in the front. They eventually turned off the water just to get rid of the hassle. I just went insane for the last week researching refrigerators. I fell in love with that beautiful kitchenaid counter depth with the faux wood finish as well. In the end I had to rule it out because the freezer was so small, and a $3500 refrigerator had to meet my needs without me purchasing a separate freezer. In the end I went with the kitchenaid KRFF707ESS. But back to why I started this, I was reading how bad refrigerators can actually be with holding or reaching safe temperatures in all parts of it. Now I'm pretty much afraid to open the doors unless it's cold outside on a Tuesday evening during a full moon, let alone when I need ice. Plus, the bottom freezer lacks organization and finding what you need can feel like digging through a toy box. I had the same hard decision recently because I almost always have owned refrigerators with ice/water dispenser.....but I went with my gut and bought the refrigerator without the water/ice dispenser on the door. It has the ice box in the bottom drawer. I thought I was going to miss the water/ice dispenser on the door but I do not....I absolutely love it when I open the new refrigerator and see how wide and spacious it is! LOVE! LOVE! The ice/water dispenser took too much room, which I prefer to have inside the refrigerator. Good luck! Our Kenmore bit it after just 6.5 years..and the repairman said the same thing to us...Hard to get the parts, we can't fix it. It still (sort of) works...so its a beverage fridge in the garage..holds no food because it can't keep the appropriate temp. moving on...I just LOVE the fridge you posted. I think you should pull the trigger, i think you are stressing too much over the industrial handles. the fridge itself is beautiful, and i think that is what people are going to notice. If this was a custom fridge meant to mimic your cabinets, then i could understand worrying about the handle- but i really think it will blend just fine! I've never had water on the outside, but i'd probably love it!- i think that's up to you and your husband! We have the water on the inside, ice in a drawer. I like it just fine. As far as having people over I just use a pitcher for water in that instance, much cheaper. How often are people in your fridge, really? I LOVE my crushed ice and having the ice and water dispenser on the outside. I've never had a KitchenAid appliance. The picture of the first fridge IS gorgeous!! Hard decision. Can't wait to see which you pick. We got used to the ice dispenser and it's nice because when you go to get water or ice, you don't get those drips down the stainless like you do when the icemaker is on the door. We are not huge "ice-people" so it doesn't bother me to scoop out the ice when needed. One thing that doesn't thrill me is that the freezer door is a little clunky. I wish it opened and closed a little smoother but that might just be the way french door models are. My previous fridge was a side by side. Also, the glass shelves aren't flush with the back wall of the fridge so sometimes things fall back there which is kind of a pain. But like I said, overall we are happy. It keeps things cool and it beeps if you accidentally left the door open which is helpful. I really should write a post on the pros and cons of my appliances...note to self to do that! We also bought the extended 10 year warranty when we purchased this fridge just to be safe since we haven't had the best luck with refrigerators. Having said all that, I do agree that the first fridge you showed is gorgeous! Good luck deciding. I hope my input helped! I like the single door because I think it's easier to close than French doors, and there's a ton of storage space on the door. It holds a ton of ice, which is great for parties and margaritas :P I don't care for water/ice dispensers on the front... they always seem to get cruddy quickly, and I prefer the sleeker look of the blank door. We have a RO system installed under our sink, so we just get our water from there. I can't say enough good things about this fridge. The other day when my husband and I were in the kitchen, I told him, "I love our fridge so much!" and he agreed wholeheartedly. I love having a water dispenser outside.But then again, we ended up drinking a lot more water and ended up buying a separate water dispenser! So If right now, I'd be changing my refrigerator, I'd go with no. 2. When we needed a new fridge I wanted the one without the ice water in the door for the first time in 20 years! You should have heard my husband and kids. We have to open the door to get water? Pull out the freezer drawer for ice? I mean, we really thought about all these "inconveniences". Now that I look back, how embarrassing to say that. I went with the filtered water inside the door and Ice in the freezer drawer. I'm happy to report my family is still alive with the added burdens :). In regards to someone saying about the temp going down because you're opening the refrigerator. Don't you open it to get food? Juice? Anything that's inside? To fill my large water pitcher takes less than one minute, and yes, I have to use both hands, but what would I be using the other for at that time? I have to bend down to pull out the ice bin, but I'm happy with the larger storage. Recently we purchased a second home and this time no one hesitated to go with the same fridge. Although the fought me tooth and nail for the first one! I love the look of it and I love the no water drips! At the time it seemed like a huge change, but now, I find it hysterical we actually worried about it! Good luck. I didn't realize how strong of opinions people have about a fridge!!!! You have a much different fridge than my daughter. The one at her house has water in the door and I was going to comment on how painfully slow it is to even fill a glass of water. I swear our water in the door isn't super fast, but the one inside her door feels like it takes two minutes to fill a glass. I never thought of the temperature, but when I want water I don't want to wait so long for the glass to fill. Good to know they aren't all that slow. Which do you have, if you don't mind me asking. Because yes, we open the fridge to put things in or take them out, but not for that long! We have a Maytag French door without the water dispenser. I did not want one, because the kids would always be mucking with it and I didn't want to have to clean it. My teeth are sensitive so I do not like cold water, so that was not an issue, though in the summer ice on demand would be nice. All in all, I prefer the clean look of the fridge w/o the dispenser, and don't mind any inconvenience. Go with your gut, and remember that form follows function. A year ago, we replaced the side-by-side refrigerator in our recently purchased house with a french door one. The water dispenser is inside and there is an automatic ice maker in the bottom. I LOVE it. I'd had a French door in our old house, but the water there was terrible, so we had a water cooler--didn't need to worry about ice in the door. We'd also lived with my mother for 6 weeks between houses and she has a French door with ice and water in the door. The ice never seemed to be frozen all the way, it never seemed to make enough ice, especially for our large group, and it took up way too much room on the door. We knew when we purchased a new fridge for our house, not to get one with ice and water in the door, and it has been a great decision. A year later, we are still very happy with our decision! We always do Whirlpool. (Hubby is an appliance tech and they don't have many problems with them.) Have your builder turn the 2x4's sidways behind the fridge. It'll give you a couple extra inches to work with and your fridge won't stick out as far!! We did this and love the results.I agree with the ice and water outside, I don't want to be digging in the freezer for ice. Mine is Samsung with the water and ice inside and I love it. Keeps the outside nice and sleek and it is so easy to use inside. GET THE COUNTER DEPTH. It is life changing and worth the $$$!I prefer water dispensers, but I have 5 kids and it saves them from leaving the doors open 24/7. Samsung with water on the inside and ice in the freezer. LOVE it. I drink a ton of water (but not usually with ice) so it totally works for us. The water/ice in the door always seems to be the first thing to go with the fridge. My parents have a fridge at home with a water and ice dispenser and when I lived there I loved using it! The ice can go a little crazy but I think it's worth it. I also found it made me drink more water which is definitely a plus to haha. Just bought the Kenmore version of the one you are looking at. I would not have a water & ice dispenser on the outside because of drips, leaks & maintenance not to mention streamlined appearance. BTW not all Kenmore Refrigerators are made by LG some are Whirlpool. I have a side-by-side with dispenser on the outside. It's getting old and will need to be replaced. I'd like a french door fridge with freezer like you pictured in #2. My brother-in-law has one in his summer home and so I've been around it and enjoy how it functions. I won't miss the outside water dispenser. I've NEVER seen an ice dispenser that doesn't break down at some point. I purchased a new refrigerator a few months ago with a water dispenser inside, and I love it. I mostly chose that feature because I have little ones and didn't want them to be able to make a mess. I also feel like it's too easy for ice/water to get everywhere (even for adults) and the tray can get kinda of messy. And I like having big wide shelves on the door on both sides. That said, there are a couple things I don't like. When I filling up something big (like our water bottles), I don't like that I have to stand with the door open for so long. It just seems inefficient and wasteful to me. Also, the nozzle for the water dispenser seems smaller and sticks out less, so I can't fill up some things with it. Most drinking glasses are fine, but a couple of our larger water bottles don't work, nor would a big pitcher. Though I guess that could be a problem with a door unit, too..
Never wanted ice/water in door. I think of it as one more thing that can break, as well as water leaking on the floor. I have a Whirlpool Gold French door, bottom mount freezer. Hubby uses a Brita pitcher for water. Good for you getting input from others. You can also call a repair person and ask them which brands do they have to work on the most. I research our big purchases. I followed Consumer Reports recommendation for the top of the line Maytag front load washer years ago, and regretted it. I failed to look at review sites. Front loader was replaced with a Speed Queen traditional washer last year that I love! We have a 2002 counter-depth KitchenAid with ice/water in the door but it broke a few years ago. My husband says it's the wiring, so now the dispenser's just an eyesore. I never wanted to pay for replacement filters so it's no big deal that the water dispenser doesn't work. My next fridge won't have dispensers through the door. I have the no water on door at work and am not a fan.. but I also fill up my water hourly. A plus, like you said is more ice. If you don't drink a ton of water, I'd say go for it because it's cleaner looking. but if you do, use water frequently you'll waste a lot more energy leaving the door open to fill up on water. Last summer I bought all new ss appliances. Range, DW and micro are all Bosch, and the refrigerator is Whirlpool: counter depth and NO water in door. I love it. I need the usable space in the door and to you still have ice and water. Whatever you do, you must get the counter depth or I think you'll regret it. Also meant to say I looked at Kitchen Aide but I just couldn't get past those handles. I think they look like rebar. I blankety blank hate the refrigerator with exterior water/ice dispenser that came with our house. It shoots out ice all the time, the water dispenser doesn't work, and there's an ice build up on the inside of the freezer (and yes all that gadgetry takes up too much space there). Did I mention that I hate the thing?!!!!! I had a friend who owned another brand, high end, and its ice and water dispenser never worked properly either. When we make our own purchase we will get a fridge without any of it, expect an inside ice maker. I also chose no exterior dispenser because of both the expense & because of the space it takes inside. We do have the internal water spout which we use some, but I also use a Berkey water filter on the counter & use it to fill up pitchers to keep in the fridge. Because you can just open up one half door, not a lot of cool escapes. We have a Samsung that has the water and ice on the outside. I love it! We have had this refrigerator for 6 years and have NEVER had to clean water off the front of the refrigerator....I don't understand why there ever would be water on the front of the frig. The ice also works well. We still have shelves on the inside of the door...they are just as deep as the other door, just not as wide; we put small condiment jars there on the smaller side. We use Consumer Reports for all of our appliance purchases and at the time, this refrigerator was one of the top refrigerators (and a Best Buy). Love my frig! I also would never get a refrigerator without the water and ice on the front...we use it constantly during the day. Check out Consumer Reports for their opinion on refrigerators. They have never let us down; we only purchase appliances that they recommend! For years I thought I wanted stainless...when my black fridge went out last year, we went with a "black stainless" counter depth. LOVE. Absolutely NO smudge issues. I'm not sure if I could have survived with the smaller capacity while raising kids, but it is perfect for us now....went with the Samsung two drawer model. Door-in-door for small items, which is awesome! Another upside is it blends well with the other "black" appliances until they go out and have to be replaced. Stainless is NOT "timeless" and is ending its cycle so choose wisely! I have the exact fridge as #2 and love it. I didn't want the ice/water on the outside because it's just one more thing to clean and, when at my daughter's house, there was always someone's ice not making it into the glass and ending up on the floor. Yes, the water dispenser takes two hands, but really? Is that a problem? There is always plenty of ice, even when you have guests, and if there's a concern about guests opening your fridge, set out a pitcher of water with lemons floating and be a good hostess. I keep a pitcher filled just for myself and it's no problem. I love the clean front without that "box" staring at me and as far as counter-depth or not, I wouldn't go back to the other for anything. Yes, there's less room, but how many of us use our shelves clear to the back anyway. I find it easier to see what's inside and unless you have a large family, the counter-depth is more than sufficient. The handles are unique, yes, but they also are textured which means no prints and no smears. Looking forward to seeing what you choose. I agree 100%--my next fridge will NOT have water or ice dispenser in the door. It's a mess. Agree, too, about stainless on it's way out. Honestly, I don't think the icemaker is a big deal. I still have my 22 year old fridge and we get ice from ice cube trays! When we have a party, we buy a bag of crushed ice for $2. That fridge does look gorgeous and I would consider it if my dinosaur fridge ever quits working! Good luck! We have the counter depth Kitchen Aid with water inside and a pull out ice tray in freezer. I absolutely love it. I really like the clean lines on the doors and it holds so much more food than our old side-by-side. Also, our previous fridge had the ice in the door and seems like we spent way longer waiting for it to spit out enough ice to fill-up a glass. Good luck!! Hi Sarah! I have this same exact fridge but we have the ice and water on the front door. It takes forever to load up the ice bin! We actually got to the point where we called KitchenAid because we thought the ice maker wasn't working correctly. When the service tech came out, he said everything was fine, but since the ice was on the door, every time someone opened the fridge, it "reset the ice making cycle" which is 90 minutes long. : / It is very frustrating! Julia, we had a kitchenaid with the ice maker in the freezer - same problem! It took forever to make ice. With a family of 4 and 2 kids playing sports, we never had enough ice. We have the less expensive kitchen aid refrigerator you mentioned. I've never wanted one with an ice and water dispenser in the front. I understand the convenience, but growing up our refrigerators with them ALWAYS leaked or had some sort of issue. It is a little annoying to have to use both hands to get water, but I feel like I always have both hands free when getting water anyway. I like how clean the front looks without having a dispenser clutter it up. We also have a toddler with grabby hands & the thought of a dispenser with small children always terrified me. We may or may not have a bungee cord looped through the fridge doors down to the freezer pull so said toddler can't open them. Oh! And the freezer drawer can hold a lot of weight. I speak from experience of finding that same said toddler sitting in the freezer drawer .. hence the bungee cord. ��Good luck! We have the French door LG stainless steel in NV and the white one in CA. I prefer nothing on the outside. NV has an ice water dispenser on the front that my husband loves. I prefer the clean lines. And love the freezer on the bottom. Originally got the style because hubby would take everything out to look at his choices. Now, if we keep it not too crowded, he doesn't need to do that! We haven't had problems with either LG frig. That said Kitchenaid is a great company and I do admire the inside of the one you showed. Never enjoyed it like side by side refrigerators. Best if luck. Last couple of fridges have been Kenmore. Last one had water and ice dispensers inside. Hated the water dispenser inside. Needed two hands and didn't like guests going inside. Current fridge has on door. We have reverse osmosis dispenser on our sink so really don't need water dispenser. We rarely use ice and I definitely prefer ice dispenser inside. I have that exact fridge in your last pic. KitchenAid, freezer on the bottom, water on the inside, counter depth. I love the look of it and the layout is nice but it is absolutely hands down the worst fridge I've ever owned. Hate to say that. I want to love it but I've had repair people here 3 times and I've owned it only 16 months. AND, I live alone so it doesn't even get a lot of use. I've owned a lot of refrigerators in my 60++ years -- never ever has any of them needed service. This guy is a lemon. I am now waiting for a new freezer door to be built -- meanwhile water is dripping on my wood floor and they cannot give me an ETA on the new door. GRRRR. So while it looks beautiful and matches my new dishwasher and gas/electric range, I'll never buy KitchenAid anything again. Its so funny that a single appliance can spark so much debate- I love it! My two cents- my grandma has a fridge with the ice tray in the freezer and its a bottom drawer freezer and I HATE IT. my whole family is really tall and it really is a huge inconvenience to shove your hand all the way into the back of the freezer to get three ice cubes scooped awkwardly into a cup. I almost always end up dropping ice cubes into the bottom of the freezer in the process which is worse then them falling on the floor because then I have to go digging into her 18 lbs of frozen okra and 20 lbs of frozen chicken she keeps on hand. I just purchased a new construction and was fortunately able to get my fridge within my appliance budget. I love, love, love having the ice and water on the outside of the fridge, because of the convenience I drink twice as much water as I normally would. Every time my best friend is over she drinks nothing but water because my fridge makes "the good ice"- the crushed ice :) and gives her the filtered water she loves so much haha. That being said I'm a single person so I don't seem to have any issues with ice cubes dropping everywhere and water down the front of the fridge. When my nieces come over they think getting water out of the door of the fridge is so cool that I don't mind the extra drips I need to clean up just to watch their little faces get excited that they can get water on their own without a grown ups help. If your more likely to drink less water because of the dispenser being on the inside then I'd say ditch the beauty aspect for the health benefit--I know saying that on a design blog is like the worst thing ever but at the end of the day no one is going to judge you for having your water on the inside or the outside of your fridge. I haven't read through all the other comments, but we have a freezer on the bottom and the ice maker and bin TAKES UP SO MUCH SPACE down there. Does the icemaker stay in the bottom freezer part when there is a dispenser on the door? If yes, then I'd say buy which ever one you like the looks of, if the there is not an ice bin in the bottom with the dispenser in door, then I would seriously look at the capacity space of your freezer area and determine if you have more space with the dispenser in the door. I think you need to decide if you need the fridge space, or the freezer space. We've had two french door fridges, one with water & ice in the door, and the other with no water, but an ice maker in the top drawer of the freezer. I felt like the ice maker in the fridge drastically reduced the amount of freezer space I had, whereas I didn't miss the space in the fridge by having the ice maker in the door of the fridge. (I see someone just commented the same thing above). As far as water when it's not the the door, we installed a small faucet at the sink that had a water filter that resided under the sink. We have had a French door without water and ice in the door for over six years now. We do have the ice maker in the freezer. When I replace mine it will definitely have the ice and water in the door again. I truly have missed it. And, you are giving up space SOMEWHERE, either the freezer or fridge section when you have the ice maker, so I would rather give it up in refrigerator section. Good luck with your move!! I recently bought the first "gorgeous" refrigerator as well as the matching range, dishwasher and microwave. It is beautiful! It keeps everything cold! It has 2 compressors and I love it. I had the second counter depth for 10 years until it got a leak in the refrigerant system. Apparently, according to the repair guy, modern refrigerators are only built for a 10 year life span. I didn't like the ice in the bottom drawer because my son would not close the drawer properly and all the food would partially thaw. This happened too many times. The water inside was OK but we didn't use it a lot. The new "beautiful" refrigerator has a freezer drawer that closes almost by itself. The ice that comes out of the dispenser is smaller sized which I really like. There is a ton of room in this refrigerator (measure the height requirement, it is taller) and I just love those lights. My son commented on the fact that they fixed the......closing the door while a drawer inside was open problem.......our old fridge had broken drawers but the new fridge has drawers that close by themselves if you "forget" to close them and then close the fridge door. Make sure you buy the extended warranty. Our old refrigerator cost $2000 from Sears Outlet Store. Our new refrigerator cost $3500 approx from Home Depot. I think it was worth it just for the free delivery plus we did get labor day sale price and interest free financing. Now I think I will go open those doors, stare at the LED lighting and feel the lovely cold air on my face........heaven! Congrats on your new home! Can't wait to see more. 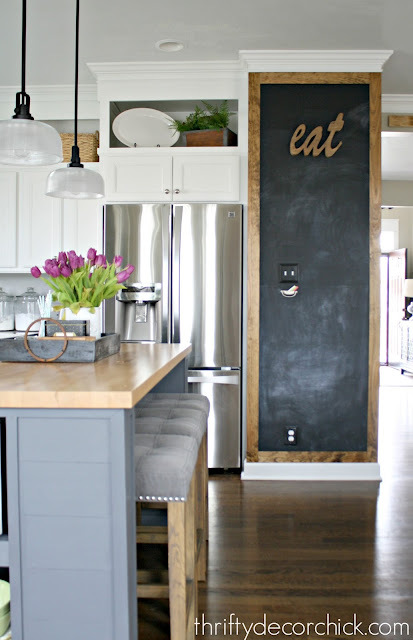 The fridge with the wood look is beautiful! I would get exterior ice and water. So convenient! We have a SubZero w/o it and its not terrible but it would nice, easier and something we would use everyday. I had trouble with kitchen aide dishwashers when we remodeled our kitchen about 14 years ago. Everything that could go wrong with them did. (and yes I have two dishwashers and it is awesome - one of the best kitchen decisions we made). Both dishwasher were lemons. But all the other kitchen aide appliance we had prior to that lasted forever! Good Luck! WE just bought the second fridge (counter depth kitchenaid with water on the inside and ice in a tray at the bottom) and so far we are loving it! I decided against the dispensers on the front because our old fridge... the ice would always get clogged up in the dispenser anyway! I just find it easier to get the ice out of the bin due to that. Getting the water out of the fridge isn't a big deal to us either, but we didn't use the water dispenser on our old one that much anyway. Plus, the price was right! and I love the sleek look without the dispensers on the front!! I love having the ice and water dispensers on the outside of the fridge. I drink so much water it's really a necessity at this point! If you go with this configuration, make sure you do not need to press the top of your glass on the lever to dispense the water because you will be spreading germs. I am going with the group that does not feel a water dispenser or ice maker is important on the outside. I actually would prefer not to have a water line to the refrigerator at all. These things take up valuable refrigerator real estate and I have seen a lot of water problems occur with that little water line. A brita pitcher of water works well for those times that tap water isn't wanted and I prefer to make ice cubes that are larger than most ice makers. Oh - and the cost is much more reasonable which is never a bad thing. 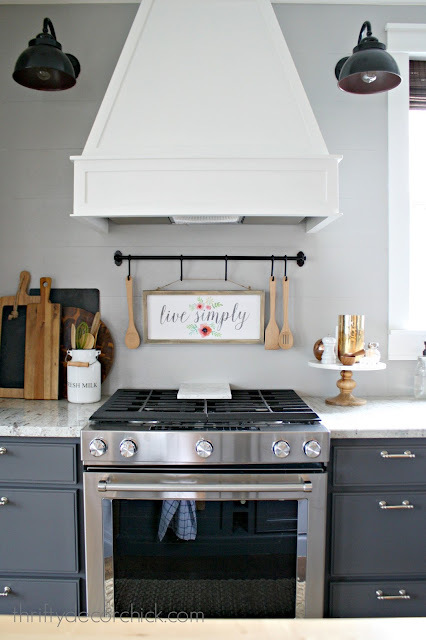 Best advice is to understand how you use these additional bits and whether you would significantly miss them if they are not part of your kitchen. How your family uses the space makes all the difference. Yes the cost difference is huge! Can you make a deal with Kitchenaid for a new refrigerator. Chris Loves Julie seem to get all sorts of free stuff, or almost free just from using certain products in there houses. 2 ranges in the kitchen, appliances in their remodel kitchen challenge etc. I bought my new Kitchenaid range only because you recommended it and reviewed it so positively. That should be worth a lot I should think. I love NOT having it on the outside of my latest fridge. I much rather have the clean lines. It is not a huge inconvenience for us a water pitcher inside fridge. I felt I was always having to clean the last fridge with dispenser on outside. It just gets gross. I have not regretted my decision. 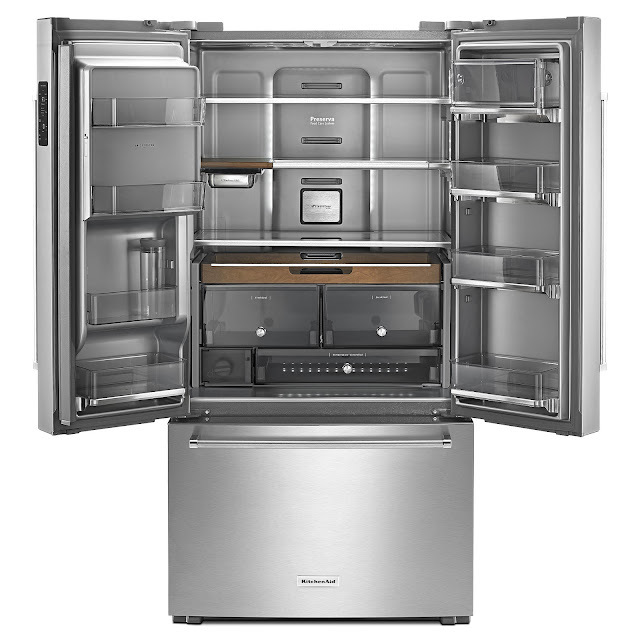 My current LOVE is the LG, stainless French door, knock twice and the right door lights up to reveal what's on the door , a refrigerated drawer for the kids snacks , and freezer drawer on the bottom ...she's a beauty... wish I could post the pics . There's still a Labor Day sale at Best Buy on their appliances too! I would never consider buying a refrigerator that did not have water/ice on the outside, no matter how much it disturbs the clean lines of the appliance, and it really does. It is just too convenient to get ice and water without opening the fridge, especially for kids, who, in my experience, love to just stand there looking in the fridge like it is imparting the meaning of life. Actually, the next fridge I buy is going to have that cute little "snack" drawer as well as the essential ice/water dispenser on the outside door. In this case, function trumps form.....at least a little.... You are so right...that fridge is completely gorgeous on the inside!! We have the first french door fridge that came out (Kenmore) and the water spout is inside. HATE IT!!! 1. It takes two hands. 2. Water will drip down and onto the freezer door bracket which will end up rusting. 3. Is it really energy efficient if you have the door wide open waiting 1-2 minutes to fill the water glass/bottle. 4. It's inevitable that while you are getting water, someone wants to walk through. We purchased it at the Sears Outlet. It has a dent on one door on the side and they knocked $700 off the price because of it. Price was a definite consideration. Get the fridge with the dispenser on the outside. I have never liked the ice/water on the outside. Just not very neat looking in my opinion. Plus to me they look messy with water stains and the splashing of ice or water onto the floor. I would go with all smooth, but of course these things might not be a biggy for you. We have a JennAir with water and ice inside. Past fridge was an LG with water and ice on the outside. I hands-down love the water and ice inside. Not only do you not have drips on the stainless all the time, but the front is much cleaner looking. No one in my family minds opening the door to get the water or ice from the freezer. You should consider how much water you and your family drink. We are BIG water drinkers here -- all five of us filling our 8-12 oz glasses multiple times a day. My mother-in-law has her water dispenser inside the fridge and it's the biggest PIA to stand there with the door open. I've started bringing our own bottled water (the big dispenser type) to her house whenever we are there for a day or more so I don't have to listen to her yelling at the kids (or me!) to "Close the refrigerator door!!" Kenmore from Sears is the same as Whirlpool, not LG. I only know, because my Dad worked at an appliance repair place for years! He always said that Samsung and LG would take months for the parts to come in. He also said to NEVER get a Bosch. We have a Whirlpool. A few parts have broken over the years, BUT they are easy to find and replace yourself. Our Kenmore was LG. :) Some of their French door versions were that brand. Not a huge fan of French Door Fridges. My vote (not even in the running) is a single door fridge on top, with Freezer Drawer(s)on bottom, with icemaker. No water or ice in the door. Clean look, easy to load groceries from counter, because you dont ever have to walk around a door. The door can be hinged on either side. Just softener. It's more expensive, but it removes things from the water like chlorine, which is a problem for us in San Diego). Good luck!! Actually our Kenmore fridge was LG. Some of their French door versions are made by LG. That's why we had such a hard time finding parts. Splurge on counter-depth, skip the water in the door. I cringe every time I see my fridge sticking out past the cabinets in our new house. But I do not miss the water in the door one bit! I had on fridge with the water in the door and didn't love it. I felt like it took up too much space inside the freezer and it wasn't that big of a deal to open the door and get the ice. We have super hard water in our area and even though there was a water softener for the hot water, it didn't do anything for the cold. Long wet story later, the minerals built up around the water dispenser and one night (always at night) it somehow jammed on and water leaked/poured all over the floor. I totally loved my Frigidaire with the freezer on bottom. We chose Frigidaire in our new house which by the way has 90% of the same finishes as your new place. PS You will be happy you chose counter depth. On a remodel about 15 years ago my builder cut the drywall out behind the fridge and braced the wall between the studs properly and it looked like our fridge was built in. Loved it!! I have a Kitchenaid Counter Depth fridge with ice/water on the door. I use it all the time and love it...and it's more energy efficient than opening the door to get ice and water! I have a LG Refrigerator with the double doors & freezer on bottom that doesn't have the ice/water dispenser. I love it. I've never had a fridge with ice/water in the door so it hasn't been a big deal.